Certainly both collections could have fit on one PS4 release, but the Switch release will be one cart and a DL code. 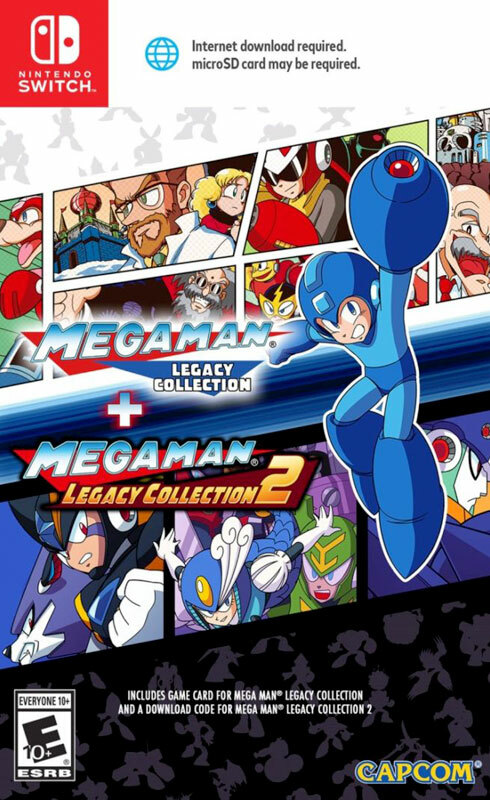 I was excited for Capcom's Mega Man Legacy games when announced for the PS4 and promptly bought them both. At the time I wished they were all on a single game dic, but I understood the profit implications of two games rather than one. I can't be surprised to see a similar release strategy for Nintendo's Switch. The first volume will be released on a cartridge with a download code for the second volume. I'm sure this will spike sales of SD cards. I was late to purchase a PS4, but still wanted to check out the next level of gaming available on the platform. I soon discovered there were many retro games available for the platform. I began by buying the 2 Atari collections from AtGames and several offered by Limited Run Games. As my PS4 game collection grew, I had far more retro titles than modern games. I'd bought the console to experience the latest tech, but wound up buying the Crash Bandicoot Trilogy, Bubsy, and Shante - among others. I've enjoyed the console, but rumors of a PS5 release make me hope there's still a few years left in the PS4 lifecycle. The Switch has certainly proven itself over it's first year, but after the Wii U failure, initially it wasn't a sure thing. Now, everyone wants to have their game on the Switch. Those complaining about processor speed and frame-rates have faded away and are eager to put their games on the platform regardless of specs. It's laughable to see the change in stance once the Switch began to dominate. Now that so many retro-style games are coming to Switch, I should stop buying them for PS4. I"ll try to focus my PS4 purchases on modern games and keep my retro-inspired purchases for Nintendo's Switch. We'll see how that works out as the Spyro Reignited Trilogy sets to release in the Fall.